It’s fun to browse Pinterest looking for cute teacher gifts for teacher appreciation week, but the cute ideas aren’t always practical and the cost can get prohibitive. There’s one gift I’ve found that is MORE appreciated by teachers than anything else, and the good news is that it doesn’t cost a thing. Many teachers will tell you that the best gift they’ve ever received is a thank you note from you and your child. 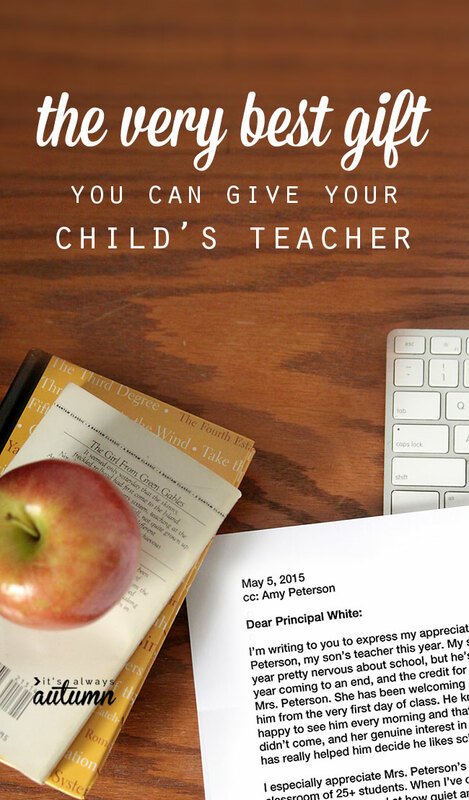 So write your child’s teacher a note, and then go one step further to make it the best teacher appreciation gift ever: write a short letter to the school principal telling him or her just how amazing your child’s teacher is. This way the teacher feels appreciated AND her boss knows she’s doing a great job. I’ll admit, I don’t write letters to the principal every year. But when one of my children has had a teacher that went the extra mile to help him, I want that teacher’s boss to know, and I want my appreciation reflected in that teacher’s employment file. Writing a letter takes less time than finding a cute printable on pinterest, and it might have a positive impact on the teacher’s career – that’s going to last longer than any treat or trinket I could give. The first time I had the idea to write a letter like this I wasn’t quite sure what to say. “This teacher is awesome” didn’t seem like it would cut it. So I spent a few minutes brainstorming the things I most appreciated about my son’s teacher and jotted them down. Then it was easy to write a few short paragraphs describing why I thought this teacher was awesome. I delivered a copy of the letter to the principal, and included a copy in a thank you note I wrote to the teacher so she’d be able to read what I had written as well. 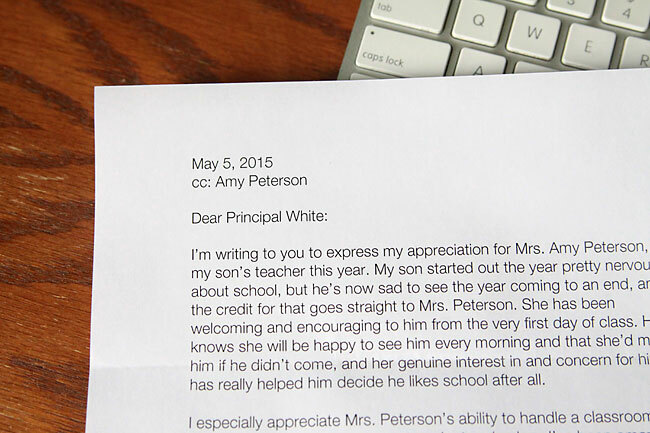 Turns out the principal was so impressed by the letter that she read it to the entire school staff at their end of year meeting. To help you know where to start if you want to write a letter to the principal, I’ve included some prompts below. Try to include specific details (I appreciated the effort he made to find books that were appealing to my reluctant reader) instead of generalities (he’s just great). If there were struggles, mention the ways in which the teacher helped. Remember, your letter doesn’t need to be long. Two paragraphs with a few sentences each are plenty to convey the reasons you especially appreciate this teacher. Ask your child why she liked her teacher and what projects or assignments she liked best. Use these prompts to jot down a few things you noticed and appreciated about your child’s teacher this year, then put them together in a short letter to the principal. It’s quick, easy, cheap (free! ), and just might turn out to be the best gift your child’s teacher has ever received. 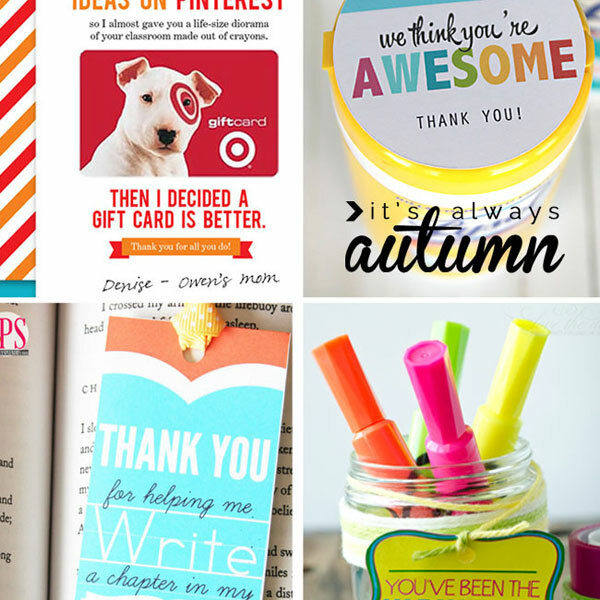 And if you want to include something fun as well, check out these 20 ideas for cute AND practical teacher appreciation gifts! GREAT idea! I sure hope more people do this! I had read this someplace else. I am planning to do it for all of their teachers, past and present. That’s a great idea, however for me this year not such a great idea. While I love my daughter’s assigned teacher (he’s not taken an admin position and the class has a long term sub), I can’t stand the principal. yes I’ve written a looong letter to the principal before (or rather the head of the school) but it was not a nice one. I just wanted to say thanks for this idea. I’ve always written small notes to the teachers, but never to the principal (mostly because I haven’t had cause to) but this year has been amazing, and this is the perfect way to express that to them. Thanks girl! Thank you for the prompts. Sometimes starting is just so hard but these get the juices flowing. List point of gift is what i consider.